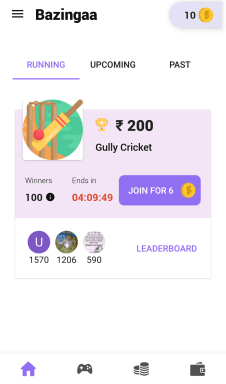 Bazingaa is an android app where you can play games and win cash prizes. Bazingaa is not new. It has been around for about 5-6 months. Bazingaa was released on Oct 4, 2018, and MPL(another app where you can play games and earn paytm cash) was released on Sep 6, 2018. So Bazingaa came less than a month after MPL. But failed to grow as rapidly. Currently, MPL has over 10M downloads on Google Play Store while Bazingaa only managed 100k+ downloads. So MPL and Bazingaa may be following the same concept but MPL clearly has gotten more popular and consequently has higher cash prizes. You join a contest for a game. The entry for the contests is usually 6 coins. You will get 10 coins as a signup bonus and Rs. 2 if you install Bazingaa with a referral link. But to earn more coins you’ll need to watch video ads. For every ad, you will earn 2 coins. So once you have used up your sing up bonus, you’ll need to watch 3 videos to accumulate enough coins for 1 contest. Once you have joined a contest you can play unlimited times until the tournament ends. Your cash prize will depend on your score. You will earn Rs. 2 when your friend signs up on Bazingaa using your referral link. Your friends will also get Rs. 2. You can earn a maximum of Rs. 10 in a day and Rs. 2,000 in total. But the minimum amount you can withdraw is Rs. 100. Which is too high, considering the prize pool of contests. On top of that, they charge a “service fee” of 20% on every withdrawal. Yep, that’s nonsense. MPL transfers payments instantly to Paytm/bank account without any “charges or service fee”. The service fee is just a way for them to save money. That’s all. Even though Bazingaa is legit it’s nowhere near MPL. MPL not only has tournaments with bigger prize pools they also don’t charge any fee on transfers. MPL has more than 9 games and tournaments are live for each game throughout the day. Which is not the case for Bazingaa.